You may know the USDA Forest Service as the steward of 193 million acres of national forest land, but the agency is much more than that. Its Research and Development (R&D) branch is the largest forestry research organization in the world, charged since 1928 with a congressional mandate to make “a comprehensive survey of the present and prospective requirements for timber and other forest products of the United States.” The branch’s Forest Inventory and Analysis (FIA) program drives the survey that meets that mandate. Surveying the nation’s forests involves maintaining 355,000 permanent sample locations on private and public lands across nine time zones from Guam to the Caribbean and monitoring a grid of approximately 6.5 million photo points. While the traditional focus has been on rural forest land, the FIA program is expanding to include urban forest resources. They also survey private land owners and wood-processing facilities across the country to understand the flow of wood products from state to state and to international customers. With this data, Forest Service scientists are responsible for the annual carbon accounting of forests for the U.S. under the National Greenhouse Gas Inventory (as required by the United Nations Framework Convention on Climate Change). They also use the data to create annual reports for congress; five-year updates for each state; and specialized studies on many other topics, including land use and land cover trends. Because many research plots are located on private land, their exact location is sensitive information and is not shared outside of the agency. Through a set of analytical processes, the Forest Service imputes data from these samples to satellite imagery (typically Landsat and Modis products), creating continuous maps summarizing hundreds of variables such as species ranges, forest condition, harvest rates, forest health, and carbon stocks to name a few. Historically, consumers of inventory data were members of congress, state forestry agencies and agriculture departments, academia, NGOs, and the forest industry. There is a long tradition of sharing well-crafted printed reports and documents along with static maps targeting these communities, though this was not an optimal research methodology as we entered the digital age. Users could download summary tables and raw data, but they needed strong technical skills and expertise in forestry to effectively use these resources. 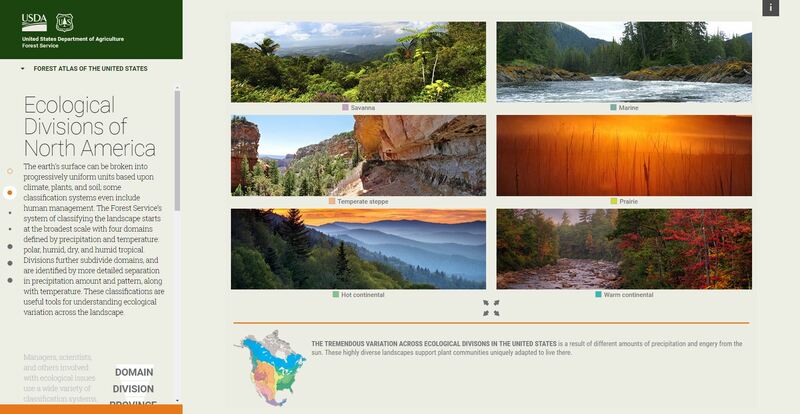 Over the past year or so, FIA and Esri have been collaborating on an engagement portfolio of data and information products including an online interactive forest atlas. Please join us at the Esri User Conference to see the latest and hear where this innovative collaboration is headed and tune in here for the next installment of this collaboration.